Collection of 'Cool and Unusual Chess Sets' from all over the world. 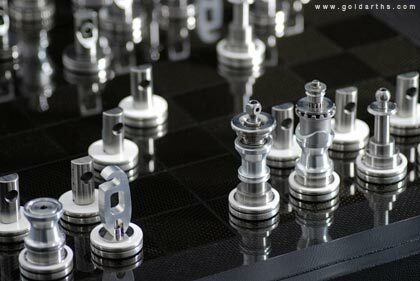 Renault F1 Parts Chess Set: This attractive chess set is made from old Renault parts, comes at a price of $41,600. 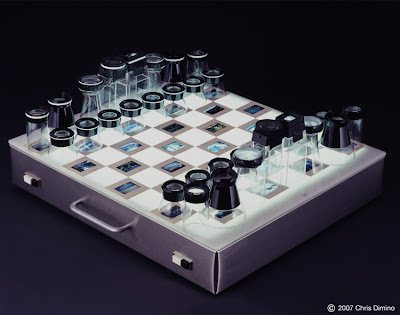 Magnifying Glass Chess Set: Designed by Chris Dimino, this unconventional chess set uses magnifying loupes of various shapes and sizes to form the rankings on a light box board with checkered slides. Portable Digital Chess Set: Designed by Pengtao Yu, this digital chess set concept features a digital projector aside from the conventional chess pieces. It comes with different playing modes that allow you to use it as per your requirement. It comes with an old fashioned mode that allows you to play face to face just like an ordinary chess set; while on online mode it allows you to play using physical pieces. Apart from these it comes with learning or practicing mode that allows you to play against a computer or watch and learn the moves played by chess masters. 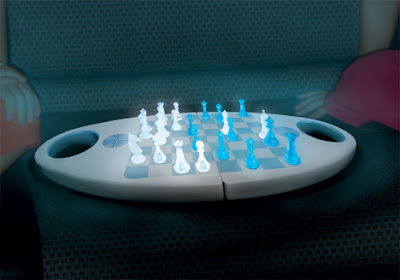 Glow Chess: Cool concept chess set from designer Craft; it uses Conductive V30 Velcro technology that illuminates each piece when placed on the chessboard. 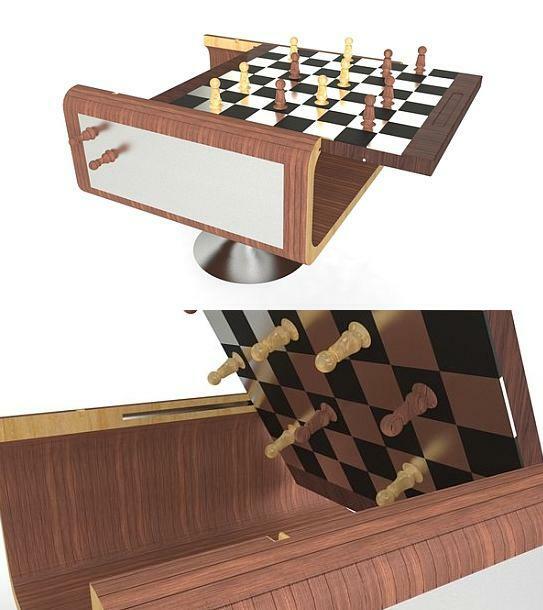 Flipboard Chesstable: This innovative chess set can be turned into a compact utility table when not in use. 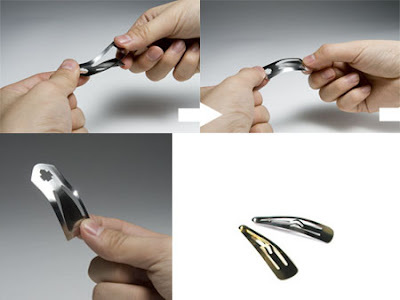 You just need to flip the surface, and the metal board holds the magnetized pieces while upside down. 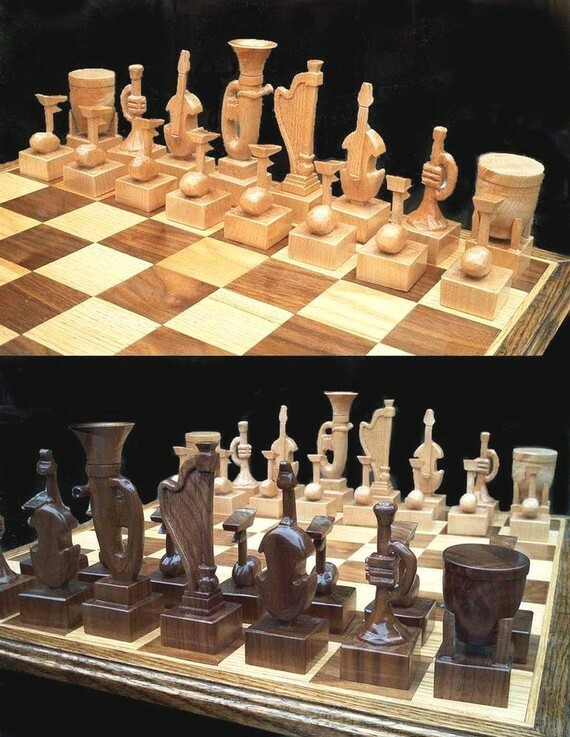 Chess Set 4000-FM: The pieces are made from leather while the board is made from pear-tree; its designed in such a way that the pieces can be placed into the board's insets. It costs about $9790. 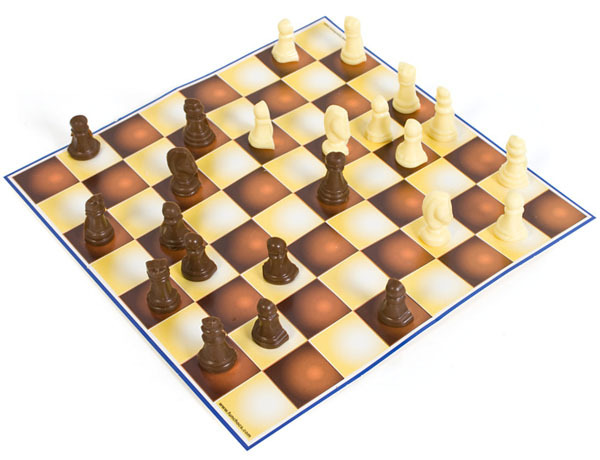 Chocolate Chess Set: All 32 pieces are made from white and milk chocolate; once you take your opponent's pieces out, you can eat them. 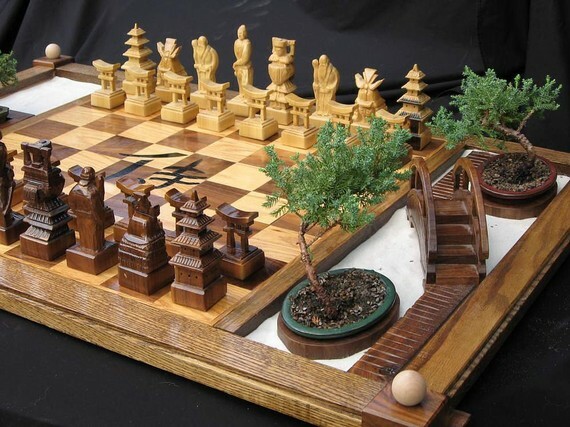 Samurai Chess Set: Hand carved from solid maple and walnut; this themed chess set from chess set artist Jim Arnold measures 42" wide by 27". What makes it interesting are sand gardens featuring rocks, a bridge, a walking path and three small trees (and they need to be watered). 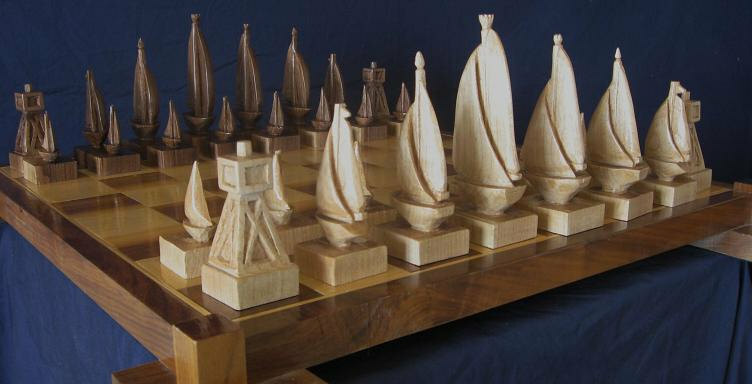 Instrumental Chess Set: This chess set features musical instruments hand carved from solid maple and walnut. 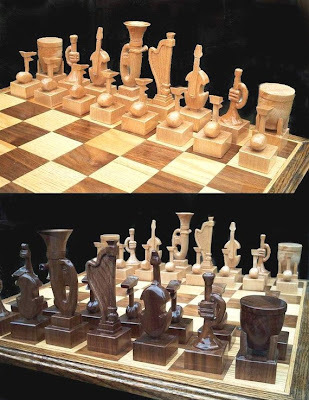 Wobble Chess Set: Designed by A Mumma, this beautifully made concave board creates an interesting interaction between board and pieces. Sailboat Chess Set: This cool handmade wooden sailboat chess set features 28 sailboats and four channel markers for the pieces. 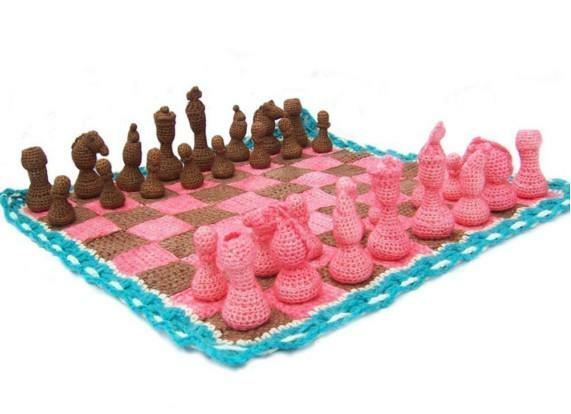 Crochet Chess Set: Here we have a crocheted chess set by Etsy seller Sharon Coleman. One can get the pattern as well as the actual crocheted set at her shop. 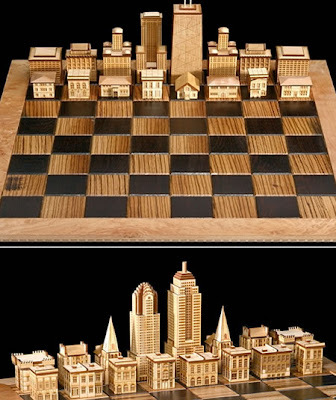 Chess Set by Steve Vigar Designs: Crafted from wood, the pieces feature skylines and residential architectural styles. Comes from Steve Vigar Designs and costs about $2,100. 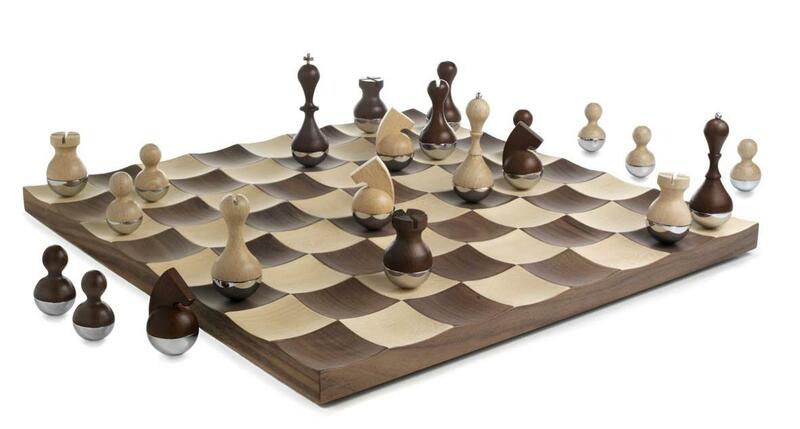 Kiki de Montparnasse Chess Set: Designed by Kiki de Montparnasse and Aruliden, it features thirty-two individual pieces in attractive matte and gloss finishes and a handmade walnut board. This luxurious décor set costs $10,000. 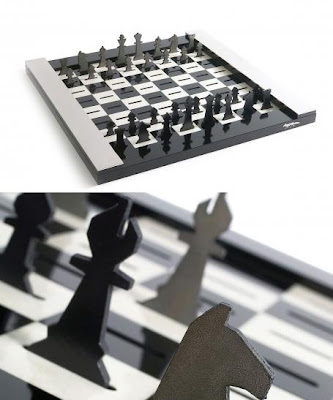 Okai Plai Chess Set: Designer T Larsen Roed, Armand Bentzen and Maria Bacus Edvardsen came up with an interesting chess set that seems to lower the factor of seriousness, and makes it more attractive for the common you and me. 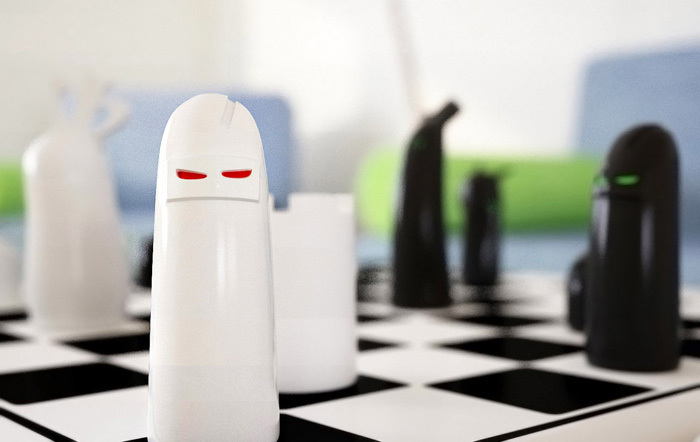 The chess set lets your imagination run and find a favorite among the different characters. Don't miss to check out "Cool and Unusual Chess Sets - Part: 1| 2." 15 Creative Lamps and Unusual Light Designs - Part 9.